Foraging for local berries is a fun and rewarding activity. The best part is that you get to make some yummy desserts afterward. Unfortunately, I can only take so much pie and cobbler before I never want to see it again. Now that summer is here, I'd rather opt for something a little more light and refreshing and less heavy on the stomach. 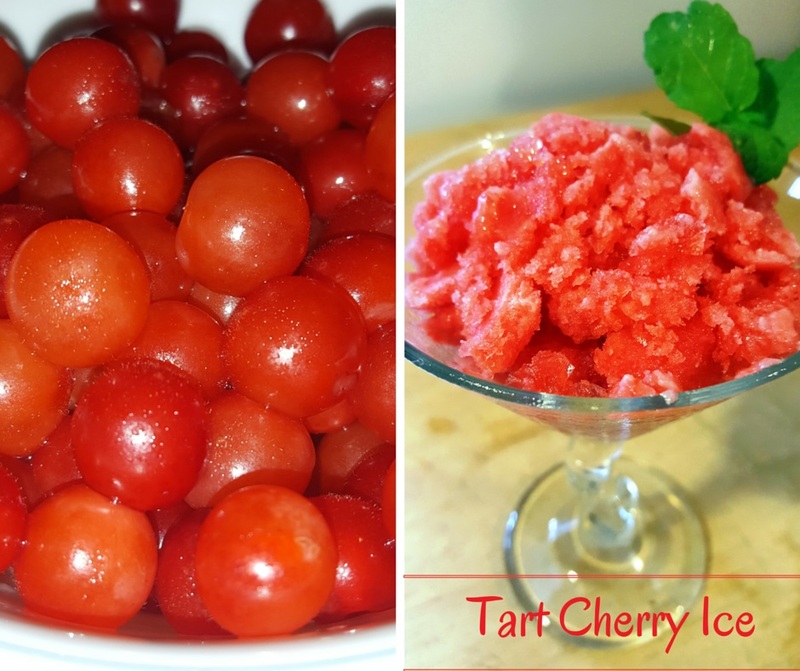 I decided to try out a shaved ice recipe using the tart cherries I found. Luckily I had all the ingredients, which isn't very much but was pleasantly surprising nonetheless! I was worried it would be too tart but the sugar and lime juice do a great job in balancing it all out. I just used some raw, organic sugar but feel free to try honey or another type of sweetener instead. Pitting 2 cups of cherries might seem a little daunting but I promise it's worth every bit of work and the rest of the recipe is super simple. If you pick your own berries you must pit them first which takes some time so if you have someone there to help, it will go by much quicker! Put the pitted cherries directly into a blender or food processor with the lime juice and blend until smooth. In a small saucepan over medium heat, dissolve the sugar in the 1 cup of water. Turn off the heat and add the mint; let cool. Remove the mint and add the sugar mixture to the blender with the cherry mixture. Pulse for a few seconds to incorporate. Pour into a shallow pan and freeze. Once frozen, you can use a spoon and shave the ice into a glass then top with a sprig of mint for a special touch.